The exchange sought to build regional cooperation to address the ongoing division on the Korean peninsula while highlighting the unique and indispensable contribution of women’s leadership in peacebuilding and social development. Global Peace Women Philippines representative and former Philippine commissioner for higher education Dr. Nona Ricofort emphasized the important role of women leaders. “Women are vital players in creating innovations and proposing new ways of interventions,” she said. the cultural exchange (Below) Sisterhood ceremony. to form the bedrock of peaceful communities and nations,” she said. She cited the Reunification in the Family campaign as an example such leadership. 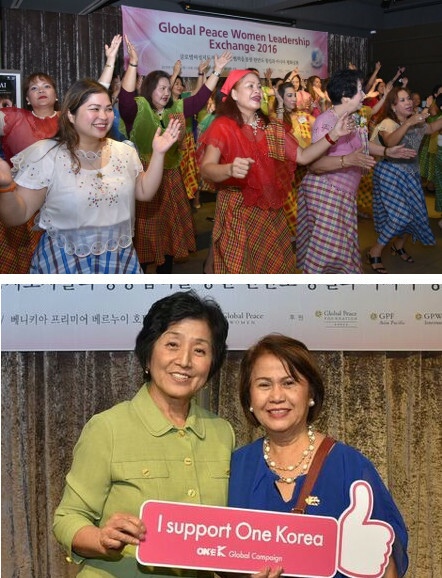 The campaign was launched by Global Peace Women in 2015 to encourage women, especially mothers, to raise the next generation to empathetically connect to their northern brethren and understand the importance of Korean reunification in regional stability and world peace. Leadership exchange visit to the 38th Parallel. President Seo appealed for international cooperation to resolve the division on the Korean peninsula, encouraging the women to join ongoing efforts such as the One K Global Campaign which uses music and popular culture as a platform to raise public awareness and global engagement for Korean reunification. The Global Peace Convention 2017 in Manila, Philippines will include a One K concert featuring popular K-pop stars promoting the message of regional peace and Korean reunification. A visit to the Demilitarized Zone vividly illustrated the grave situation of Korea’s division. 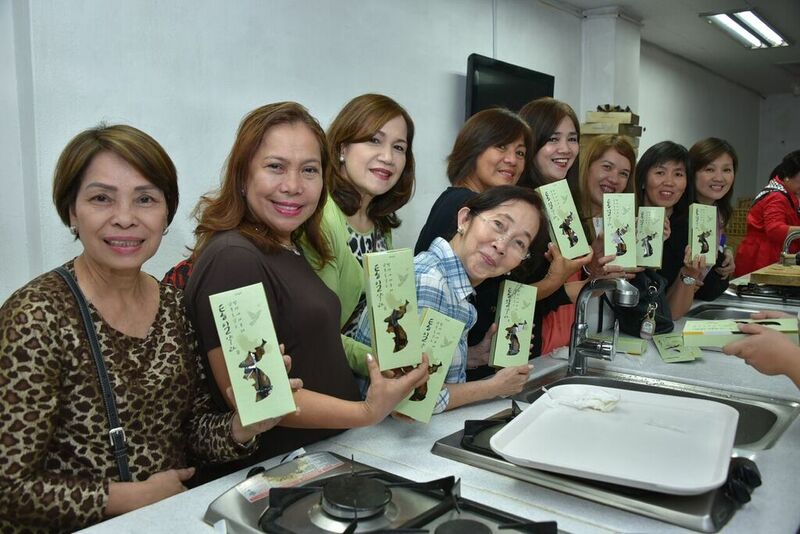 Women hold up "Reunification Sweets"
The women also joined the production line at a sweet factory owned and run by North Korean defectors that manufactures traditional North Korean confections that they named “Reunification Sweets.” Filipina, Japanese and North and South Korean women baked side-by-side, investing in a common hope for peace. Notable guests included Inja Hwang, former congresswoman; Mihwa Kim, GPW Korea representative; and Keiko Kobayashi, executive director of the NGO Jun-Ai, a GPF Partner. Ms. Kobayashi is the lead actress in the film Jun-Ai (“unconditional love” in Japanese), which was screened during the exchange. The film presents a story of a woman who overcomes cultural and national divisions by her unrelenting commitment to her community and family. The women were paired in a sisterhood ceremony that emphasized their connection as One Family under God, creating a beautiful blend of cultural and national differences. The eye-opening, five-day exchange showed the relevance of Korean reunification to regional and global peace. Women from all three countries expressed their determination to offer continued support for the issue through the upcoming Global Peace Convention 2017 and in their daily lives. 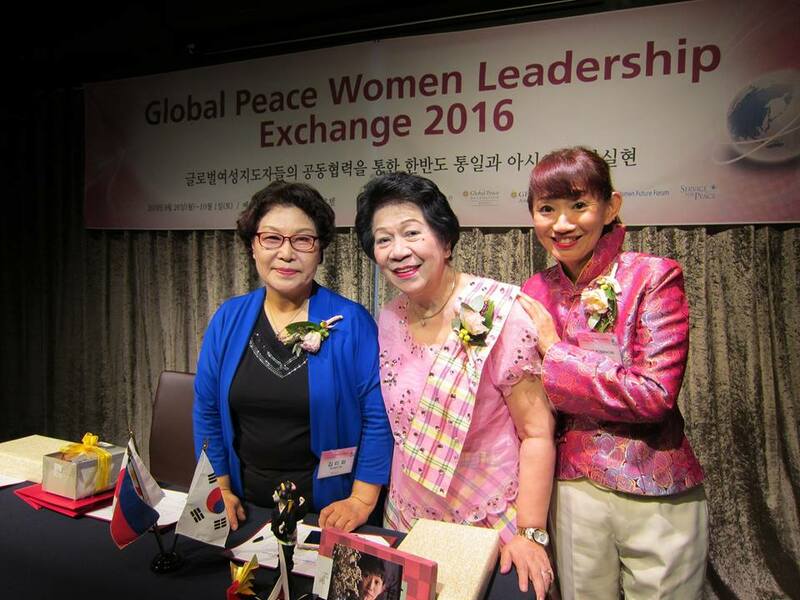 For more information about the Global Peace Women Leadership Exchange, click here.